Gianneos work can be divided into four periods of different duration. The first is a stage of development, between 1913 and 1923, under the European influences of the great German romantics and the French impressionists, principally in piano music. The second transitional stage occurs between 1923 and 1932, from his move to Tucumán to his collaboration with the Grupo Renovación. This stage brought together his formal European training and the folk elements through which he sought a national musical language. The third stage, one of maturity, is the twenty-year period from 1933 to 1953, during which the two principal tendencies derived from the use of folk-music and from neo-classicism combine into a unique musical language, refined over the years and ending in the last piano works in a wonderful simplicity and economy of resources. The fourth stage of full achievement covers the last fifteen years of his creative life, when he moved gradually towards his disciplined use of the dodecaphony. During this stage, he only wrote four works for the piano, and after 1959 he no longer wrote for this instrument. In 1962, after a period of four years in which he wrote nothing, he composed the ballet El Retorno. Immediately afterwards he wrote the cantata Angor Dei, the Three Pieces for violin (1963), Antífona (1964), the Poema de la Saeta (1965) and the Overture for the 150th Anniversary (1966), the last of these composed two years before his death. The most important of Gianneos piano compositions come from the third stage of his career, as he continued to refine his musical language. The acclaimed Suite of 1933 is in three movements and achieves a happy synthesis of vernacular elements in a contemporary musical framework, with national elements that are not merely exotic or picturesque additions but rather form the backbone that supports the musical discourse of the work. In the first movement, in A minor, he uses a range of contrapuntal techniques suggesting the form of the sonata. The thematic economy and the use and development of small motivic cells show the composers understanding of neo-classicism in a virtuoso movement of constant feverish rhythmic activity in quavers, surprising changes of timbres and registers and effective elaboration and placing of climaxes. The ternary second movement is based on a theme resembling a yaravi, a kind of sad song typical of the north-west of Argentina. As in the whole work, the last movement is firmly based on folk-music elements. Relatively free in form, three main sections can be identified, the central one of which, slightly slower, serves as melodic relief from the rapider music that frames it. The piece ends with a brilliant final section containing a virtuoso cadenza. The Sonatina of 1938 [Editorial Argentina de la Música], completed in Paris, is in three movements and is written in a limpid and balanced neo-classical language, with a generous use of counterpoint. The thematic material is derived from the rhythms and melodies of Argentinian folk-music, in writing that recalls baroque textures in its use of counterpoint and the constant rhythmic semiquaver activity. The first movement is based on a single modal syncopated theme, stated in the first eight bars, derived from the candombe rhythm, a dance of Afro-American origin from the River Plate region. The second movement is a minuet in ternary form with a coda, fresh and diaphanous in its writing, with a full use of parallel fourths that, with a series of arpeggiated chords, suggests the sound of the guitar. The last movement is broadly in classical rondo-sonata form. Its principal theme, in A natural minor and suggesting something of the Dorian mode, is based on the rhythm of the chacarera, a dance from north-west Argentina. The central section, marked Più lento, offers four successive entries of the theme in a fugato. Gianneos Sonata No. 2 of 1943 is, with the Suite, perhaps the most ambitious work of the time. It has three movements and is written in a neo-classical style, but has as its basis themes of folk origin in both the first and last movements. The first movement is a delicate contrapuntal framework dominated by a single theme that recalls the rhythm of the chacarera, worked in distinctive colours and tempi, in different registers of the piano, either in imitations or in virtuosic passages full of scales, arpeggios and fortissimo chords. The second movement, Romanza, is a lyrical song articulated over two themes, barely a little more complex than the cradle-songs of his childrens pieces. The third movement, marked Allegro molto, sets off furiously in the chacarera rhythm, above which the first theme is developed. After a short transition, strong chords diminish until the introduction of the second theme, slower, cantabile, strongly modal in character. The central part offers some short new themes over undulating scale passages, in the midst of a strong rhythm that recalls the theme of the opening. The recapitulation brings back the first theme in exact form and joins it with the second in a difficult scintillating passage of rapid scales. The closing section, brilliant and providing great pianistic display, brings a grandiose repetition of the second theme. Gianneos Improvisación was written in 1948 and seems to be an elegy, perhaps in memory of his friend, the violinist Enrique Mario Casella, who died in that year. The work is an expression of nostalgia for the countryside of Tucumán, with the first and final sections marked by a constant quaver rhythm, with the immediate repetition of the first and second phrase. The four-bar descending bass ostinato contributes to the dark, funereal mood, with the same melodic phrase used to end each phrase in the right hand. The central section is, on the other hand, more luminous and passionate. The limpid harmonies touch, from time to time, on the Phrygian and Lydian modes. Written in 1956, in the fourth period of his career, Gianneos three-movement Sonata No. 3 is cyclical in structure, heart-rending and harsh, seeming to reflect his sorrow at the death of his wife and also the turbulent and unfortunate political situation of the country. The first movement introduces the motifs to be developed throughout the sonata, always showing major-minor duality. The short second theme has a folk character. In the development the generative motifs are transformed to become opposing elements and the second theme appears fleetingly to add a tinge of sadness to the vivid drama. The second movement is in three sections, worked together in a filigree pattern of contrapuntal motifs. There is a slow and lonely sad song of the pampas, amid the dissonances of the counter-theme. In the middle section there is a distant sound of a tango rhythm, accompanying a slight modification of the opening theme, extended to be juxtaposed with the motifs of the first movement in a wild climax. The third part is a fugato. The third movement Rondo, in the clear rhythm of a malambo, takes up again the harmonic idea and motifs of the first movement. At this point appears a quotation of "Arrorró Indígena" (Indian Lullaby), one of the movements of his work Música para Niños (Music for Children) written in 1941, followed by the motif of the first bar of the first movement, but with its rhythm somewhat changed, to state again thereafter the initial basic malambo. The Seis Bagatelas (Six Bagatelles), written between 1957 and 1959, in manuscript like Sonata No. 3 and Improvisación of 1948, complete the cycle of piano compositions. Here Gianneo avoids any overt nationalism, except for the slightly tango-type rhythm of the fourth Bagatelle. The sixth, too, makes a slight allusion to the fifth of the Cinco Pequeñas Piezas (Five Little Pieces) of 1938, the moto perpetuo. These six micro-structures are in strict counterpoint, with the third Bagatelle a clearly modal canon in two parts at the minor seventh. The harmony is worked out within these parameters, with a great economy of resources, suggesting two-part inventions, as much as anything else. From the second period of Gianneos life comes En el Altiplano (In the Altiplano), a work representing a greater compromise with new stylistic tendencies, with a more refined compositional technique. This prelude is no longer a mosaic of folk-style material interlarded with romantic virtuoso passages but rather the development of a musical idea evoking the countryside of Tucumán and the music of the Andes, over an ostinato bass imitating the traditional drum accompaniment of the vidala. Bailecito alludes in its title to the northern folk-dance, the bailecito norteño. In A minor, with marked modal colouring, it is one of Gianneos most original works, combining great pianistic difficulties with a formal structure based on the original dance. Short and brilliant in character, and clearly derived from folk-music, the new techniques used definitively abandon any romantic or impressionistic European influences. The Dos Estudios (Two Studies) of 1933 make use of a zamba theme and that of a vidala, respectively. The first, Estudio con tema de Zamba quotes the first phrase of the famous traditional Zamba de Vargas, which it develops contrapuntally, presenting a certain technical pianistic difficulty with great economy of means. The Estudio con tema de Vidala, offering greater technical difficulty, develops a single theme, vaguely evoking a vidala, always accompanied by rapid semiquaver quintuplets. The Cinco pequeñas piezas (Five Little Pieces) were written in Paris in 1938 and are all very short and in ternary form, with simple melodic lines. The first of the set, however, "Requiebros" (Coquetterie), with the rhythm of a candombe, offers a theme that also appears in the first movement of the Sonatina of the same year, both very similar in melody. The second, "Canción de cuna" (Cradle Song), has a tender, subdued melody. The third, "Marcha de los Soldaditos de cuerda" (March of the Toy Soldiers), is vigorous and rhythmic in character. The fourth, "Vals sentimental" (Sentimental Waltz), imitates mannered French waltzes. The last, "Movimiento perpetuo" (Perpetual Movement), is a constant flow of semiquavers in the style of a toccata. Gianneos Tres danzas Argentinas (Three Argentinian Dances), written in 1939, offers a series of dances typical of the country. The first of these, "Gato," expands the original form contrapuntally and in its harmonic vocabulary. "Tango" reflects sentimental nostalgia for urban music in its two themes, and "Chacarera" brings out in its harmonic language the elements of bimodality and bitonality, as in the preceding dances, in an aggressively neo-classical style. "Música para niños" (Music for Children), composed in 1941, is a series of ten pieces, starting with a prelude and fugue, in obvious allusion to Bach. The Prelude recalls the Prelude in C major of the first book of The Well-Tempered Clavier. The fugue is a two-part invention constructed from the theme of the last movement of the Suite of 1933. "El Juglar" (The Juggler) suggests the circus; "Zapateado" reflects a mens country dance; "Vidalita" is a sad and expressive song. "Quenas" (Indian Flute) recalls the instrument of that name, and, in the central section, its accompanying drum; "Pericón" is a popular folk-dance; "La morochita" (The Little Dark-Haired Girl) is taken from the tango "La Morocha;" the "Aire popular" (Folk Song) is a candombe, the "Arroró indigena" an Indian cradle song and the "Bailecito Cantado" (Little Dance Song) a gato. Gianneos Siete piezas infantiles (Seven Pieces for Children), written in 1946, represent a synthesis of the two elements of the composers style: neo-classicism and nationalism. The "Ronda" (Round), legato and moderato in tempo, has a Lydian mode theme of great simplicity. The "Canción de cuna" (Cradle Song) is based on a single theme, slow and with a rhythm that recalls the vidalitas of northern Argentina. "Atardecer pampeano" (Pampean Sunset) in its title suggests the great expanses of the Argentinian pampas, its simple expressive melody giving it an intimate character. "Sombrerito" (Little Hat) is inspired by traditional folk-music, related to dances in other Latin-American countries. "Tango" is in fact a tango-milonga, whose sad nostalgic character is accentuated by the descending melodic elements of the first theme and the use of a minor key. "Tamboril" (Small Drum) is rhythmical and cheerful, referring to a small version of the drum used in various provinces of the country to accompany religious processions. Two themes alternate in the "Danza campesina" (Rustic Dance), based on the traditional gato. From the same year come the Villancico (Christmas Carol) and Caminito de Belén (Little Road to Bethlehem), simple and somewhat sad little childrens pieces on the subject of Christmas. The simple melody of the first is followed by the faster gallop of a rider in the second, on the way to Bethlehem. 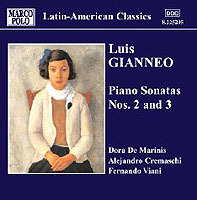 Works from the first stage of Gianneos career include the Tarantella of 1913, Canción (1916) and Te amo (1917), the Four Compositions (1916-1917), Sonata No. 1 or "Pequeña Sonata" (Little Sonata) of 1917 and the Variations on a Theme of Handel (1918), with the tangos and popular songs that he wrote under the name of Luis Ariel, Mi Changuita, No tengo Corazón (I have no heart), Alborada (Dawn) and Fanny. All the compositions of this period are marked by European influence, doubtless coming from his teachers, particularly Drangosh and Fornarini. Gianneos talent, still not clearly defined, can be seen in his management of structures, the creation of certain bold ideas and authentic and refined musical inspiration. In Sonata No. 1 and in the Variations on a Theme of Handel his leaning towards the German romantics, Schumann and Brahms, is evident, as well as the composers own deep sensibility. Tarantella consists of a short introduction, followed by the dance in binary form, with the exposition returning before the final coda. It is surprising in the asymmetry of the phrases, often cut short or joined together with unexpected elisions, supported by a traditional harmony, very simple and apt for a popular dance. Canción is preserved in manuscript and is a piece of modest proportions, with the structure of Mendelssohns Songs without Words. In A major, it is in binary form, with a repetition of the first section. The Four Compositions show a perceptible French influence. The first, "Vieja Canción," in E flat major, is a sensitive and nostalgic melody of simple outline. The second, "Berceuse," in F major with a dramatic central section in D minor, is a lullaby with a syncopated accompaniment. The third, "En bateau," in F sharp major, and the fourth, "Arabesca," in D major, suggest impressionism, with a clear allusion to Debussy in the use of semiquaver arpeggios to accompany the flowing melody. The Little Sonata of 1917 was first performed by Josefina Ghidoni in Tucumán in 1923. It is a work of romantic passion, in which Gianneo makes use of the whole battery of romantic virtuosity in the outer movements. The opening Allegro moderato, in sonata form, is passionate and stormy, with a marked contrast between the two principal themes. The central Andantino, in E major, is gentle and calm, in five-part rondo form, light-hearted and French in style, in spite of the stormy central section. The third movement is a lively rondo, in which the strong influences of Schumann do not conceal the musical personality of the composer. Te amo is a short romantic waltz, inspired by his love for his future wife, Josefina Ghidoni. The Variations on a Theme of Handel are based on the soprano aria Rejoice greatly, O daughter of Zion from Messiah. The theme and nine variations are each of eight bars, and the last variation, "Quasi preludio," leads to the fugue, after a short cadenza. Gianneos admiration for Brahms is evident in the choice of title and the form of the work. Four of the variations, in B flat major, are fast, brilliant and written in virtuoso style (Variations I, III, V and VII). The other four are slow and expressive, two of them in the minor (Variations II and VI) and the fourth anticipates the subject of the fugue. Variation IX is an improvisation in Baroque style, with a profusion of scales and arpeggios. The fugue, the most substantial part of the work, with 89 bars, opens with the subject heard in Variation IV, with three entries, developing in modulations that end the first part in D major in bar 45. The second part of the fugue offers an original treatment of the subject, by diminution, in staccato quavers, ending in a passage of expressive triplets, embroidering the theme, slightly varied in its intervals, over a dominant pedal until the final Più vivo, providing a brilliant and triumphant coda. Vals Lento recalls Debussys La plus que lente. It is a longish piece, written in recognisably French impressionist style, languid, refined, perhaps decadent. Nevertheless a Schumann quotation surprises us in the central section. In spite of evident influences, the harsh sonorities that would form part of Gianneos musical language are perceptible. Mi Changuita is a nostalgic popular tango, built on a formal scheme and with traditional harmony. It is dedicated to his daughter Celia and signed with the pseudonym that Gianneo used when venturing into realms other than those of classical music. ¿Por qué? comes from the second period of Gianneos creative life, after his move to Tucumán. It is a short piece written for the Album Intimo, for which he had earlier written his Canción and Te amo. It is also a slow waltz, sad, but not a salon piece like Te amo, but more intimate and profound. Gianneo now writes in his own musical language in a period leading to his maturity. The first of the Three Preludes, "Nocturno," is quietly mysterious in mood, tinged by impressionism, in spite of elements typical of Argentinian folk tradition, such as the melody doubled in thirds, the rhythm of the huella, a dance from central Argentina, and the superimposition of duple and triple metres. There is a constant alternation between major and minor, particularly evident in the last bars, a continuing feature of Gianneos style. In Noche en la Sierra the musical language is still clearly linked to his early style, with touches of romantic piano writing and impressionist sonorities recalling the language of Isaac Albéniz. The piece consists of three clearly defined sections. The first, modal in character, consist of a constant expansion of sound from the pianissimo of the opening to the final fortissimo, with a striking semiquaver ostinato in the left hand. The second more rhythmic section has elements that point still more clearly to North-West Argentina, with a typical shifting from major to relative minor. The piece ends with the abridged return of the first theme. En el Cañaveral offers contrasts with the preceding pieces and is the only one written in a major key, E major, conceived as a romantic virtuoso work, full of arpeggios, chordal melodies, irregular note values and rhythmic changes. It is in ternary form, with a dance melody in thirds, such as Gianneo would use the following year in his symphonic poem El tarco en flor.